As early as 1976, Nat Hentoff wrote: “Once in a great while, a musician emerges with such authority and such seemingly effortless originality that his place in the front ranks of his instrument is unquestioned.” Hentoff was not speaking of promise or potential, but actual performance, and forty-two years later, with My Faith, My Life, bassist David Friesen has added immeasurably to his stature. With its two CD suites complementing each other so fully, it's an epochal achievement - a testament to the offers of faith, matched with a purposeful life. Disc One is a 13-piece solo performance on his Hemage Bass, which calls attention to the intimacy and immediacy of his compositions. 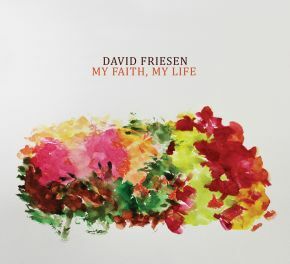 The solo piano of Disc Two highlights Friesen's supple touch on an instrument he's not generally known for. Closing the set, the composition “My Faith, My Life” sums it all up: a credo, affirmation, reverence - lower register continuity laced with sublime melody: a hymn to the Source of all song, with a fitting Amen at the close.